Below you can view all the homes for sale in the Heritage Pointe subdivision located in Covington Georgia. 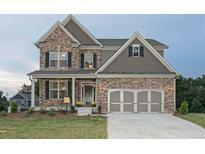 Listings in Heritage Pointe are updated daily from data we receive from the Atlanta multiple listing service. To learn more about any of these homes or to receive custom notifications when a new property is listed for sale in Heritage Pointe, give us a call at 404-998-4152. Loaded With Options! **Model Home For Sale** MLS#6528334. Sdc Realty, Llc.. Photos Are Representative Of A Mcintosh MLS#6520171. Sdc Realty, Llc..
Large Finished Basement Not Included In Tax Records. Too Many Upgrades To Mention. MLS#6123670. Bhgre Metro Brokers. Home Is Under Contruction, Photos Are Representative, Not Of The Actual Property. MLS#6121881. Sdc Realty, Llc..
Home Is Under Contruction, Photos Are Representative, Not Of The Actual Property. MLS#6117273. Sdc Realty, Llc.. Buyers Love The Avery'S Curb Appeal And Its Expansive Mudroom At The Side-Entry Garage Entrance. MLS#6113256. Sdc Realty, Llc.. Buyers Love The Avery'S Curb Appeal And Its Expansive Mud Room At The Garage Entrance. *****************Stock Photos Only****************** MLS#6099581. Sdc Realty, Llc.. Buyers Love The Avery'S Curb Appeal And Its Expansive Mud Room At The Garage Entrance. *****************Stock Photos Only****************** MLS#6075621. Sdc Realty, Llc..